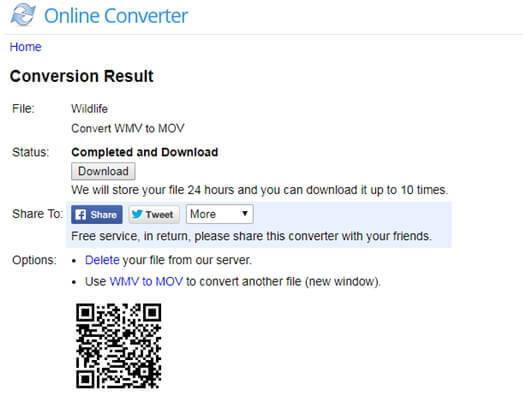 Convert WMV to MOV, MP4, AVI, MKV, and other 1000 formats. 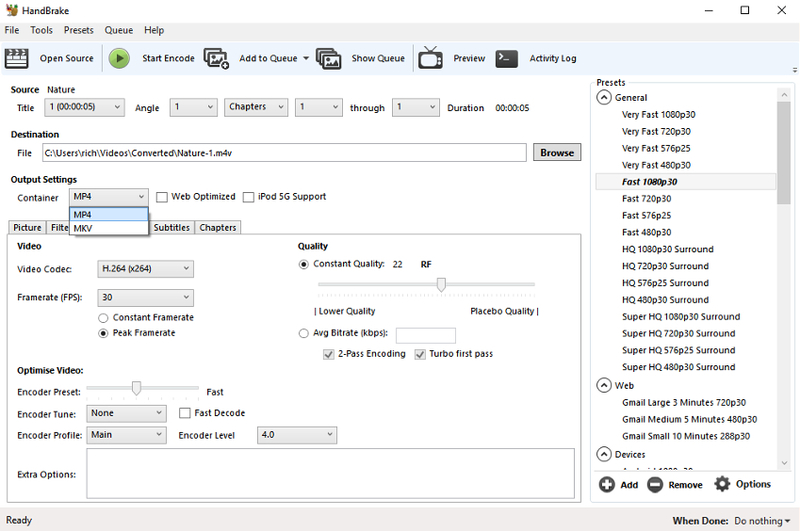 Convert WMV to optimized preset, including mobile device, PSP, TV, etc. With the growing popularity of iOS-based devices, a larger segment of people is now willing to look for any way that would enable them to play WMV video files in Mac OS or iOS without any hindrances, such as playing them on QuickTime, organizing in iTunes, editing in iMovie or syncing to iPhone, iPod or iPad. As is known, WMV is Windows files which can’t be played straight in Mac. So you are left with just one solution-converting WMV to MOV (QuickTime)! Here takes converting WMV format to MOV format in Windows (Windows 10 included) platform for example. This windows app has been upgraded, which can help you convert videos 30X faster without any quality loss. Step 1 Load WMV files to the WMV to MOV (QuickTime) converter. Start UniConverter (originally Wondershare Video Converter Ultimate) after the installation, and you'll have two ways to add WMV files into the program. 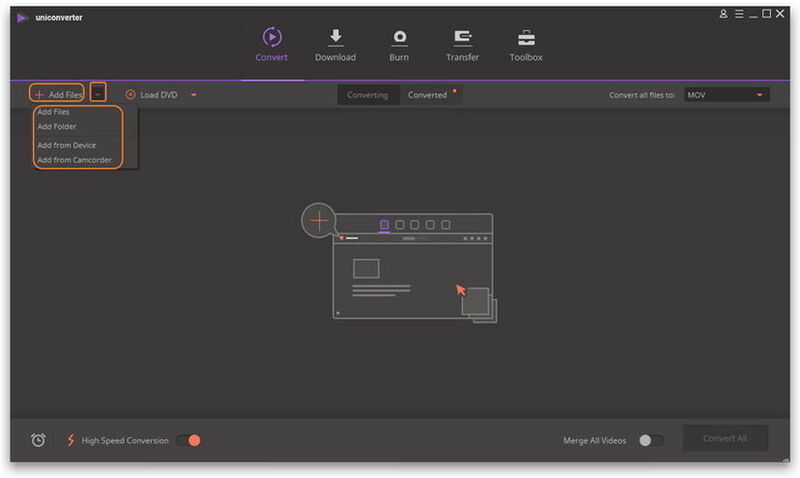 One is dragging and dropping the video into the software window directly, and the other is clicking the Add Files button in the main interface of Convert section. Note: This app offers the function of bacth conversion, so you are allowed to convert several files in WMV files to MOV files at one go. Step 2 Set MOV (QuickTime) as the output format. 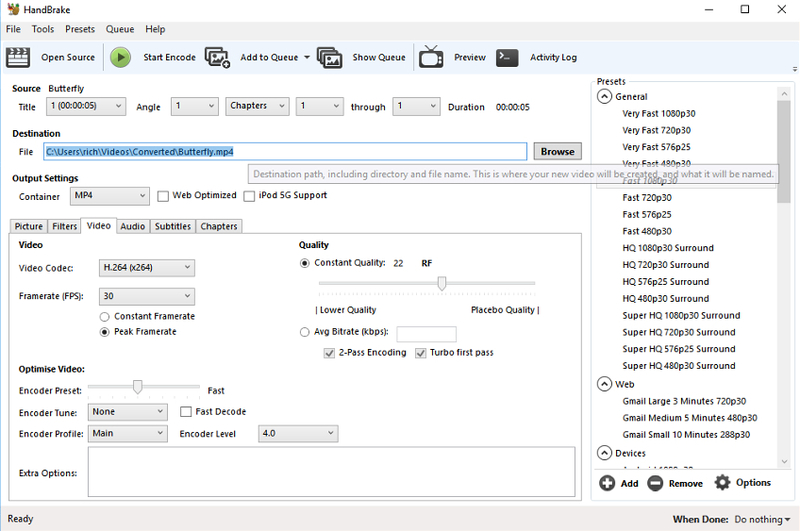 Click the down arrow button beside Convert all files to:, then select the Video tab to choose MOV in the left sidebar and select the video resolution to confirm output format. If you are planning to transfer the converted files to your iOS devices like iPad, iPhone or iPod. you can check How to Transfer Video to iOS Device. Step 3 Start to convert WMV to MOV (Windows 10 included). 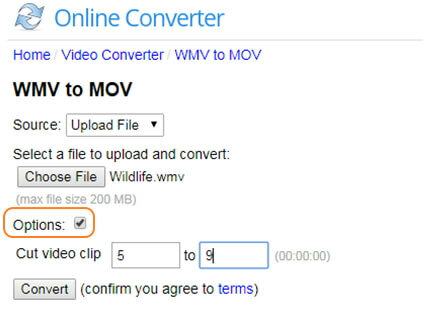 Hit on the Convert button and leave the WMV video to MOV video converter finish the rest automatically. In addition, if you are not satisfied with your video, for example, you plan to cut the black edge, rotate the video and so on, you can use the useful edit functions offered by the software. 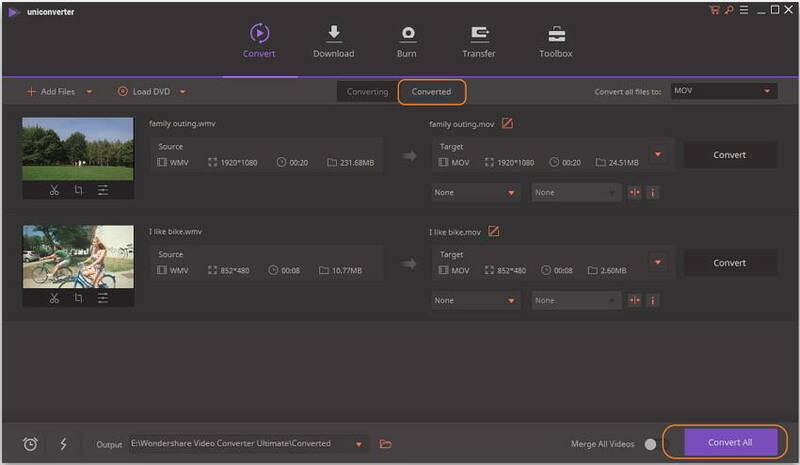 If you want to learn the details about the editing function of UniConverter (originally Wondershare Video Converter Ultimate), this guide about How to Trim Video and Combine Video Clips will provide you help. One of the best ways to convert WMV files free of cost is to use Handbrake. Handbrake is available for Windows, Mac, and Linux. While it is mainly known for its DVD ripping function, Handbrake can also convert media formats. 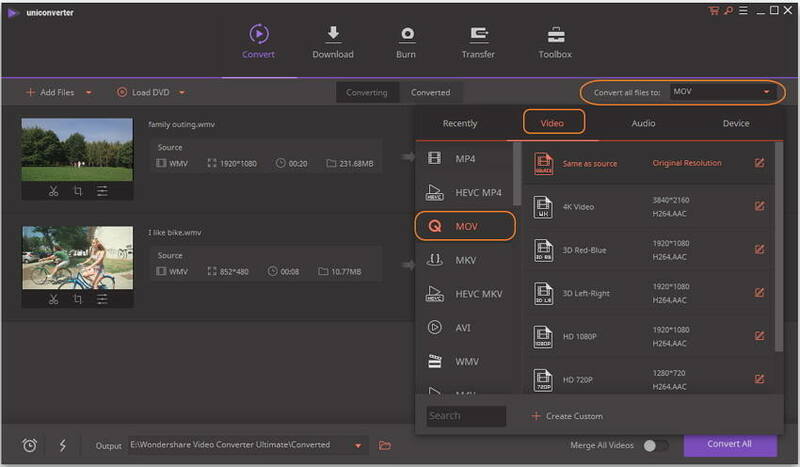 Its interface can be a little intimidating to first time users, but using the guide below you be able to convert WMV videos for free in no time. Before you proceed, download and install Handbrake from the official website, or perform an update to ensure you are using the latest version. 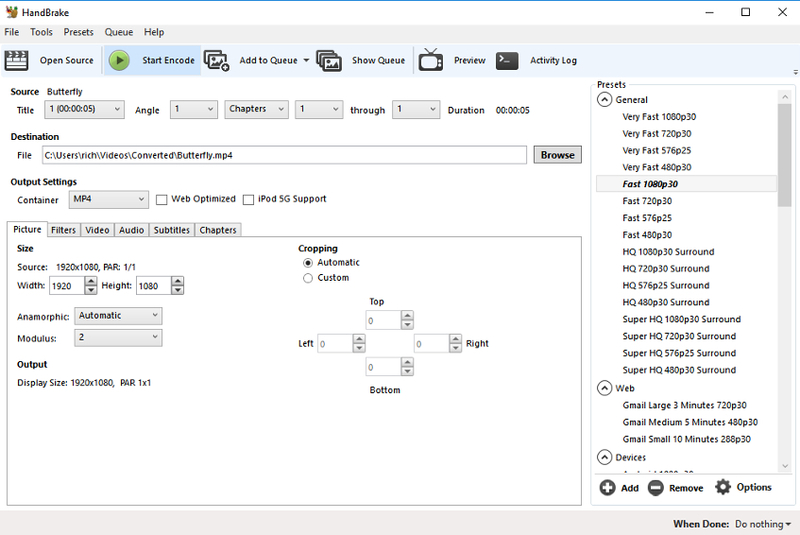 Step 1: Launch the Handbrake application on your computer, and click Open Source to import your WMV file. Step 2: Set your file destination location. 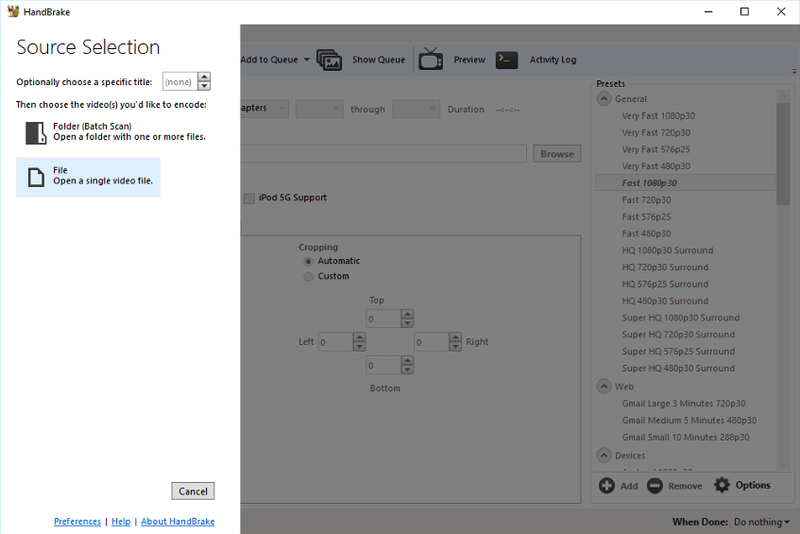 Step 3: From the Output Settings drop-drown list, select MP4. Here you also have tons of options to choose from if you want to further customize your settings. Unless you know what you are doing, use the default settings. Step 4: Press the Start Encode button at the top of the window to start the process. For this part, I'd like to talk about Onlineconverter.com, one of the widely-used WMV to MOV converter online available on the web! It converts almost any common video/audio formats to your desired formats, including convert WMV (Windows Media Video) files to MOV (QuickTime Movie) video. What's more, you can use it to extract music from your favorite movies and edit videos to your like. 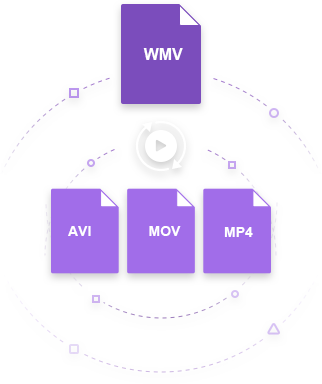 Most importantly, it's user-friendly that you can quickly proceed WMV to MOV conversion within 4 simple steps. First of all, you will get a long list of file formats to convert. Just choose the corresponding landing page and here takes WMV to MOV. 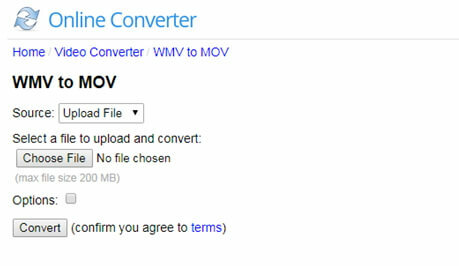 Now upload the WMV file you wish to convert to MOV format. Note that the maximum file size can be 200 MB, which is larger than most competing converters. Tips: Check the Options, you'll be able to cut WMV into several clips. In fact, you can do a lot more to your video with its advanced editing features. 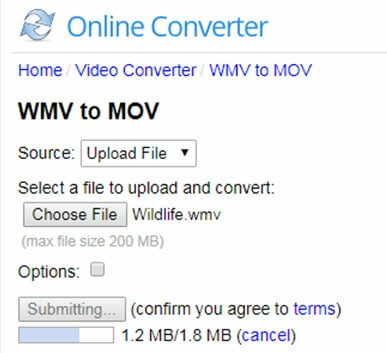 Hit the Convert button to start converting WMV to MOV online. Once the conversion is completed, it will direct you to a web page where you can download the converted .mov video. Cannot work without a network connection. Easily get stuck while uploading, which requires you to do all over again. Convert videos to the basic formats only, not including 3D and HD videos. If you want to know more about WMV to MOV online, go to Top 5 Free Online WMV to MOV Converters.